“Where to Invade Next” (2015). Cast: Michael Moore. Director: Michael Moore. Web site. Trailer. • In Italy, Moore examines employee rights and compensation, illustrating how companies have managed to provide ample wages and benefits while remaining profitable and creating a healthy work/life balance for their staffs. • While visiting France, the filmmaker looks at school lunch programs, specifically how children even in the poorest school districts are being provided nutritious, almost gourmet-style meals on a daily basis, a practice that teaches good eating habits for life. • In Finland, Moore shows how the nation’s “radical” education policies have led to its children becoming some of the smartest in the world. And what do those reforms include? A shorter school day, free-form curricula and virtually no homework, practices that keep kids from becoming bored and that free them up for what are seen as more important pursuits, like developing their own interests, piquing their own curiosity, fostering relationships with others, spending more of their time engaged in play and exercise, and learning how to lead happier and more balanced lives overall. • On a stop in the tiny nation of Slovenia, Moore looks at the country’s free university system, one that provides a quality (and in many ways more challenging) education to those wishing to attend – regardless of whether or not they’re Slovenian citizens, an option that has fostered growing appeal among loan-strapped Americans seeking to complete college. • In Germany, Moore details the benefits of the nation’s health care system, specifically its provisions covering preventive well-being measures, such as enabling citizens to attend all-expense-paid visits to facilities like spas that offer such services as yoga, relaxation programs and massage. • While in Portugal, the filmmaker outlines the country’s drug decriminalization program (one spanning the full range of substances) and how this hands-off policy has led to lower rates of incarceration, drug use, and the need for rehabilitation and recovery services. • In Norway, Moore shows how the country has revamped its prison system, establishing facilities with minimal security (including guards who carry no guns) and an emphasis on rehabilitation (through developing skills and encouraging creativity), all of which has led to some of the world’s lowest crime and recidivism rates. • On a visit to the North African nation of Tunisia, Moore profiles the country’s progressive women’s health programs (especially its contraceptive practices) and how they (and other reforms) emerged from citizen-led initiatives against a once-inflexible government, an extension of the Arab Spring movement that was born there and swept through other neighboring lands. • Saving the best for last, Moore’s trip to Iceland shows how greater involvement by women in business and politics has led to significant improvement in correcting the nation’s once-severe economic ills. Moore also details how the tiny island country has successfully prosecuted and jailed many of the corrupt bankers who caused the nation’s monetary issues in the first place. Through interviews with thought leaders in these various areas, Moore illustrates what these countries are doing right – and how far short of the mark the U.S. falls by comparison. The result is an eye-opening look at meaningful solutions to thorny issues, plans that can be implemented relatively simply and at little cost – and all of which pay big dividends in the end. Documentary filmmaker Michael Moore searches the world for good ideas to steal and bring home to a beleaguered U.S. in his latest effort, “Where to Invade Next.” Photo courtesy of Dog Eat Dog Films. Many people (especially American politicians) might look at these ideas and think them unrealistic, concepts that are too good to be true. Yet these programs and institutions obviously exist and are flourishing in the nations where they’re present. So how is this possible? In the end, it all comes down to the conscious creation process, the means by which we manifest the reality we experience through our thoughts, beliefs and intents. In essence, these programs and institutions exist because their creators believe that they’re possible – and the proof is in their very real, tangible materialization. Those who conceived the ideas behind them were, on some level, convinced that their creations could indeed be realized. And, with the power of their creators’ thoughts behind them, they subsequently came into being. But the mere existence of these programs and institutions doesn’t tell the whole story. Their effectiveness, both in terms of results and costs, is equally important, and those attributes of these creations have also been made possible by beliefs. Admittedly, such outcomes require some rather proficient and sophisticated envisioning capabilities, as well as the concurrence of the masses, but those prerequisites can be developed to produce results that clearly speak for themselves. By pushing the limits of what’s thought to be possible and combining those notions with an unshakable faith in them, the creators of these programs and institutions have brought forth models worthy of emulation. Of course, if those seeking to copy these ideas harbor doubts, they’re unlikely to achieve success, since doubts are themselves a form of belief, one that generally undercuts (and usually cancels out) the intents aimed at realizing particular outcomes. Eliminating these contradictory notions is thus essential for success, though it’s sometimes easier said than done, especially if the belief in those doubts is strong. However, those who have overcome their doubts (and fears) stand to reap tremendous rewards for their efforts. Not only do they have an opportunity to see their dreams realized, but they also place themselves in a solid position to yield additional dividends. The preventive nature of many of these programs, for instance, ultimately saves money in the long run by keeping unwanted issues from getting out of hand in the first place. What’s more, the good feelings and positive outlooks these initiatives inspire lead to a generally happier and healthier populace, one that’s more productive, creative, and compassionate toward others and the needs of the collective. In light of that, then, one can’t help but wonder, “Why wouldn’t a country want to create and promote such affirming conditions for its citizens?” That’s a good question, especially for a nation such as the U.S., which likes to think of itself as the land of opportunity, a place where anyone can realize his or her most cherished dreams. But that’s hard to accomplish when the majority of its residents are overworked, underpaid, undernourished and stressed out, as well as often inadequately cared for by a profit-driven health care system. If Americans hope to turn things around, these are some essential questions they should begin to ask themselves, paying particular attention to the beliefs they hold and the creations they’re ultimately manifesting. Perhaps the greatest irony in all this is the misconception that these progressive ideas were born overseas. However, as Moore points out, many of these notions, ironically enough, are based on ideas that originated in the U.S. For example, many of the workers’ rights and benefits programs prevalent throughout Europe today are rooted in American initiatives from the late 19th Century. Similarly, the Icelandic litigation program used to prosecute the nation’s corrupt bankers was actually based on an American plan employed against the guilty parties in the U.S. savings and loan scandal of the late ʼ80s and early ʼ90s. Interestingly, in the wake of the global financial meltdown of 2008, Iceland has jailed nearly 30 corrupt bankers, while the U.S., by comparison, has prosecuted only one. This disparity speaks volumes, not only in terms of outcomes, but also with respect to the priorities of the two nations. Fixing the present circumstances is genuinely possible, as these examples clearly illustrate. What it takes, though, is the will and desire to make it happen, something that stems from our beliefs, both individually and collectively. But, with that behind us, truly remarkable results are possible – and we don’t even have to invade anybody to make it happen. 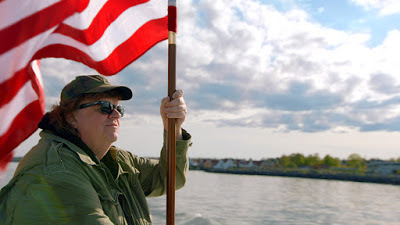 Even though Moore’s films (and politics) don’t jibe with everyone’s sensibilities, “Where to Invade Next” provides an excellent survey approach to its subject matter, with segments that link nicely from one to another and ultimately serve to provide an integrated comprehensive whole. The signature humor that typically infuses the director’s movies is present here again, but it’s toned down somewhat from his previous efforts, providing just enough chuckles to keep the picture entertaining without becoming too smug, self-serving or partisan. The interview segments hit all the right notes without overkill, providing valuable, meaningful insights in a number of areas. Admittedly, the pacing slows a bit in the last half hour, but otherwise this is easily the filmmaker’s best effort to date. Given the challenges beleaguering us these days, we can’t really afford to rule out anything to set matters right. Keeping an open mind and having the courage to pursue the seemingly outlandish may be just what it takes to resolve today’s pressing ills. The inspiration and ideas provided by films like this could well serve as shining examples of what we can and should do to repair a broken system – and we don’t even have to steal anything to make that happen.